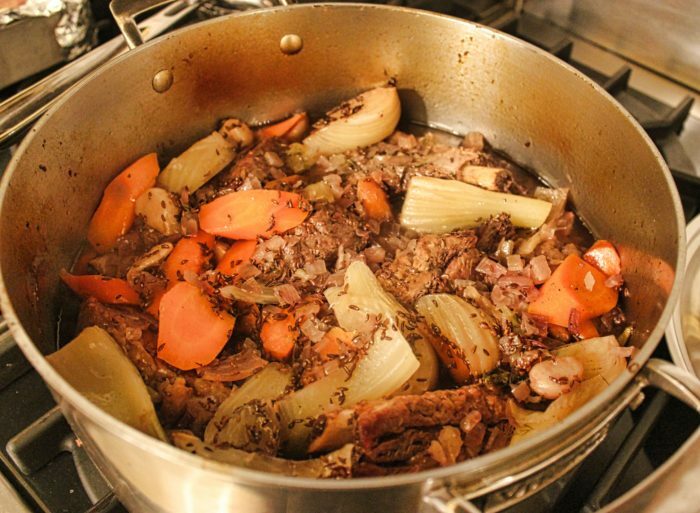 On cold winter weekends, nothing can match the warmth and aroma of a slow-cooking meat dish, filling the kitchen or the whole house with promises of a luscious meal. The recipe title says “roasted” and the picture shows “simmering” ribs. You do both here, an initial oven roast to start the journey and then a long finish in that rich deglazed liquid that only roasting can produce. This recipe is from Roasting by Barbara Kafka, a book I did a CBT review for. Roasting is filled with beautiful and charming meat wonders. Here, Barbara suggests serving with boiled potatoes. We went a richer route, placing the meat and veggies atop noodles. Rice is yet another option. Not a fennel fan? Too much like licorice? The transformation here with long cooking is a rich broth is quite remarkable. The fennel is soft, succulent, and has this “pure vegetable” taste that you can’t name perhaps — but that you can certainly enjoy. Oh, the 40 cloves of garlic? Do it. Don’t think of skimping. Have some toasted bread on the side and a great bottle of red. Place oven rack on center level. Heat oven to 500°F. Arrange ribs in a 14 x 12 x 2-inch roasting pan. Roast for 20 minutes. Turn the ribs over. Roast 25 minutes more. Reduce oven temperature to 350°F. Using a slotted spoon transfer ribs to a large platter. Pour or spoon off excess fat. Put pan on top of stove. Add the stock or other liquid and bring contents to a boil while scraping the bottom continuously with a wooden spoon. Add caraway seeds to liquid. Reserve. Arrange half the onion, the garlic, fennel, and carrots in a 5-quart casserole. Add half the salt and pepper to taste. Arrange the ribs in a single layer in the casserole. Layer the remaining onion, garlic, fennel, and carrots over and around the ribs. Sprinkle remaining salt and more pepper to taste. Pour deglazing liquid over all. Cover with foil and a lid, if you have one. Cook 3 hours. Remove and serve with boiled potatoes, those noodles or rice.